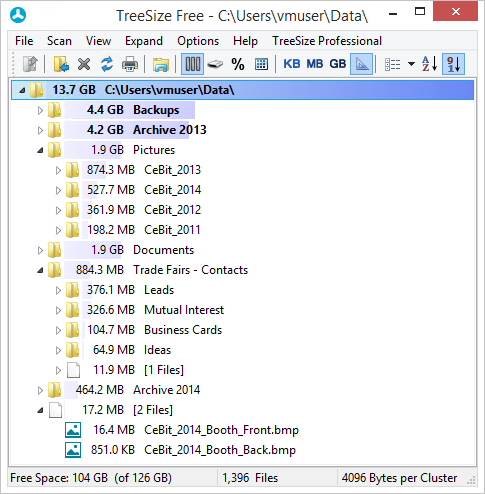 TreeSize Professional is a powerful and flexible harddisk space manager. Find out which folders are the largest on your drives and recover megabytes on them. TreeSize Professional shows you the size, allocated and wasted space, the number of files, 3D bar and pie charts, the last access date, the file owner, the NTFS compression rate and much more information for several folders or drives you choose. It also lets you search for old, big and temporary files. The application has an intuitive Explorer-like user interface and it is fast and multithreaded. You can print detailed reports or export the collected Data to Excel and to an HTML, XML or ASCII file. TreeSize Professional can be started from the context menu of every folder or drive. The abominable ribbon introduced in version 4.0.0.362 destroyed the once great program. Shame on anyone who copycats M$ GUI perversions. Though I prefer Q-Dir and xplorer2 lite, I use this sometimes when I want to quickly determine the size of subdirectories. Wow.. 2 years no preview? What kind of sofware is this! Great example of simple and useful software. I'm using it for more than 10 years (at least). What nags are you speaking of? Only if you scan very large drives it occasionally nags with offer to upgrade. Keep up a good work. This program is quite good. very fast (much faster than SpaceMonger) and i have not seen any ads or nags while using it. The only thing i would like to see is the ability to view the [files] count as actual files inside this program (without right click, Explore) - at the end of the day that what i want to know: what is taking up the space in that folder. Yes, but FileForum doesn't make that distinction, does it? Let's all hate every developer who wants to make a living coding rather than work at Wal-Mart. There's a dozen other freeware disk space apps out there that do the same thing or more than this adware version by JAM. Yes, it's adware, and when I first pointed that simple fact out here, my comment was removed completely. But being idiotic enough to put a permanent nag in a "faux freeware" utility is enough to make me avoid all of their products. I believe that if you call something "freeware", you ought to really make it freeware, and leave people the hell alone. So it's adware passing itself off as faux freeware. Pay the developer and get the Pro version which is excellent. I love how it shows an ad for TreeSize Professional each time you use it, or even do a refresh on a big-enough directory. Nice. Good example of a "hammer-and-nails" basic utility: Nothing astounding. Just a useful tool for doing something simple. I am a student in the 8th class and am pleased about freeware like this. I have looked for such a tool already for a long time to receive the summary fast need, which files at most storage. A very useful tool, which extends the abilitites of the windows explorer.